WHY STACK YOUR IDEALLEAN PRODUCTS? If you’re serious about maximizing your fitness and getting the best results you possibly can from your hard work, the Fat Loss Stack is exactly what you need to reach your goals. IdealLean Protein, BCAAs, and Burner are formulated to work as the perfect team on your fitness, helping you get the absolute most out of every single workout. And when you buy your IdealLean Products stacked, you get a huge discount on your purchase, saving up to $64. It’s a win-win for your budget and your body. These three products are the triple threat you need for amazing workouts, fast recovery, and spectacular results. Think about your car: it needs lots of different fuels to keep it going; not just gasoline but also water, oil, filters, and so much more. Your body is no different. With the Fat Loss Stack, you get all three amazing workout-maximizing products for less, and they are the perfect companions to your fitness and nutrition plan. IdealLean Protein is a high-quality 100% whey protein isolate supplement with only 80 calories, 0g sugar, 0g fat, and 0 carbs. It comes in two delicious, indulgent flavors: French Vanilla and Chocolate Brownie. IdealLean Protein contains our proprietary IdealFit Recovery Blend to get you back to the gym faster, and a combination of vitamins and minerals formulated just for women, including vitamin D, calcium, and folic acid, to make sure that you’re functioning at the top of your game every single day. 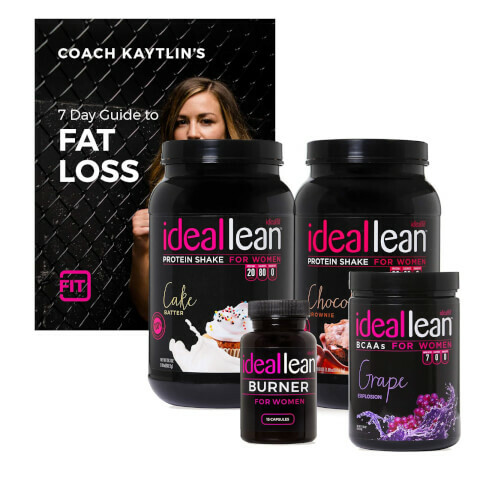 Each serving of IdealLean Protein contains 20g of protein to help your body build lean muscle and torch fat. IdealLean BCAAs are branched chain amino acids with 0g sugar, 0 carbs, and best of all: 0 calories. IdealLean BCAAs are specially formulated to maximize weight loss, recovery, and lean muscle building for the lean, toned look you want. To help you get the absolute max out of your workout, IdealLean BCAAs also contain coconut water powder for improved hydration and IdealLean Fat-Loss Blend to help you get lean results. IdealLean BCAAs come in refreshing Green Apple and Raspberry Lemonade flavors, both with 5g of BCAAs in a high-quality 2:1:1 ratio. This fat loss stack is amazing, i love the protein (chocolate brownie and french vanilla are my faves) and the BCAA's help with sweet cravings (peach lemonade is the best!) the fat burner has some caffeine for a pick me up in the mornings so you can kill your workout! The 30 Day Fat Burn stack is amazing! I love the ability to purchase my three favorite items in one combo pack! The protein tastes amazing and fills you up, the BCAA's help build lean muscle and the Fat Burner help curb my cravings and help with weight maintenance! My favorite stack by far!